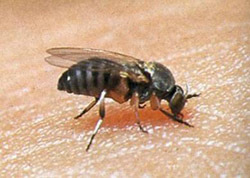 Notes: Buffalo gnats are an extreme seasonal pest for poultry and live stock producers. Begin to swarm in late April rather than their usual mid-May. Huge amounts are found in three to five miles of flowing water. Their life cycle lasts two to three weeks. Also a problem for people working around the birds and doing outside tasks. Vanilla extract mixed with tap water creates a repellant that can be sprayed on the birds and their quarters. The extract can be rubbed directly on the birds’ faces and heads (the most vulnerable areas) with a soft cloth. For a spray, mix 1 ½ teaspoons of the vanilla extract with a quart of water.